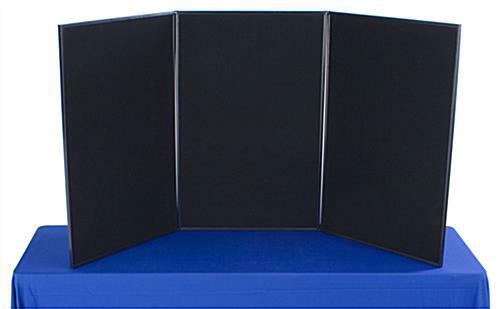 Dual-sided exhibition display board has both black and grey surfaces. 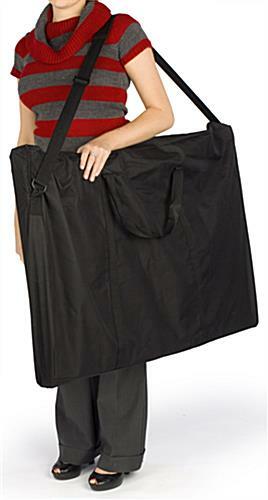 Carrying bag provides easy transport and protects trade show panel when not in use. 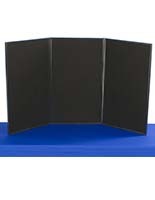 Hook-and-Loop receptive material for easily attaching accessories to exhibition display board. 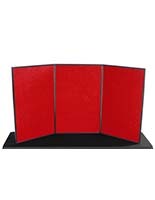 This 3 panel display board features (2) sides that are each a different color! 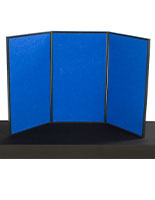 The tabletop display has reversing colors on each side; black on one side and gray on the other providing a two-in-one value for presenting your materials. 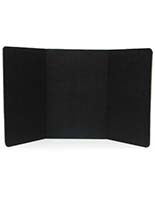 The folding panel display, 3 panel display board incorporates hook-and-loop receptive material on its surface allowing you to easily attach accessories and graphics using hook and loop tape. 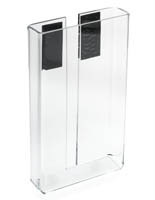 The wide variety of acrylic accessories with hook and loop are available for you to purchase along with this display. 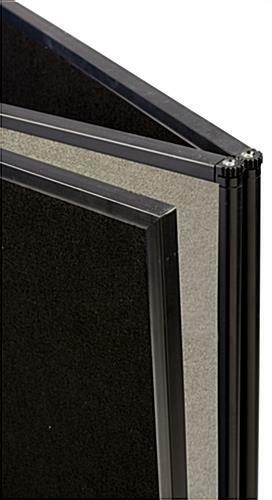 This 3 panel display board is completely customizable, enabling you to use your choice of graphics or accessory displays & apply them to the surface of the board. 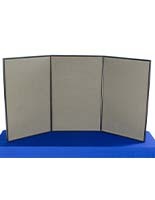 This portable panel display, 3 panel display board has (3) panels that each feature 22-7/8"w x 34-1/2"h of usable fabric. This gives you plenty of space to create your presentation. 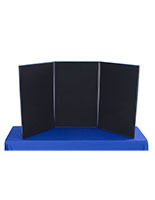 The 3 panel display board, like a trade show display, includes a carrying bag with a shoulder strap for transporting the unit to and from events with ease. We offer this exhibition display board as a great way to create a presentation to impress and educate clients and customers. 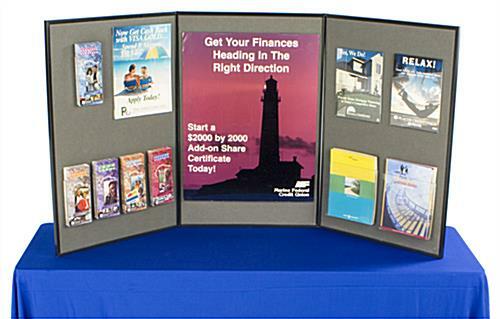 Buy the exhibition display board today! 72.0" x 36.0" x 0.625"
Well priced display board and got what we needed. Job fair displays for a municipality. Price conscious and had a local offer of a USED similar product for more than twice the price of this display. Delivery was prompt and on time for expectations. Recommend. Bryan, thank you so much for taking the time to recommend our display board! We strive to provide high-quality displays at competitive prices, and we're so happy that this product proved to be an excellent, affordable solution for a job fair display. Thanks again! I've owned a variety of tabletop display units through the years, and this is by far the best. And as a bonus, it is also the most inexpensive. Sturdy, well-built, the best hinges of any unit I've owned. Sturdy carry bag included in the price. Arrived well packaged. Thank you so much for the excellent review, Thomas! We are thrilled to hear that this tabletop display is the best you've ever owned, from build quality to price and portability. We hope you'll continue to turn to Displays2go for your display needs! I really love this display. Very sturdy and durable; love that it comes with the carrying case and that it is reversible. I would highly recommend. This is just what I needed to transform our library into an art gallery. The carrying cases are really nice to have too. And the fold-ability helps with storage. I am currently trying to figure other ways these awesome display boards will benefit our school. Analiese, thank you so much for the wonderful review! We're so happy that you're using our display boards to transform your library into an art gallery! 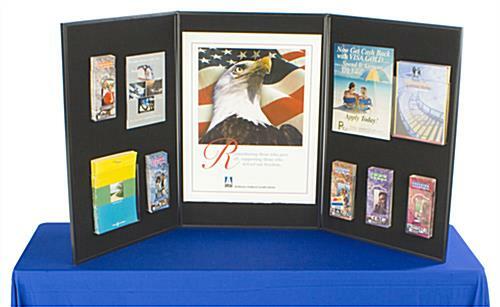 The velcro backing makes it easy to switch out your artwork and attach other components like brochure holders and infographics. We find that these work great for presentations as well, such as passive hallway presentations for educational outreach initiatives. We can't wait to see the other ways you come up with! If you post a photo on social media, feel free to use #displays2go and we'd love to share it with our customers for inspiration. Thanks again! My old display took a tumble of a table and was broken. It was very old anyways and needed to be replaced. I found Displays2Go online and was skeptical since i have never heard of them. My organization had an event planned that i needed my display for so i was kind of in a pinch. Ordered my display and received it within 5 days! Just in time for my event. The display was more than exceptional and fit my needs perfectly. I received it in a timely matter also. I have no complaints what so ever. 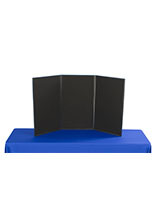 If you need a table top display, Displays2Go is the way to go! Thank you for the great review, Dylan! We are glad you found us and gave us the chance to show you who we are. We look forward to working with you on future projects.